WordPress is a great platform for building web sites. You can think of it as a PHP framework with a built-in admin panel, user levels, themes and plugins. 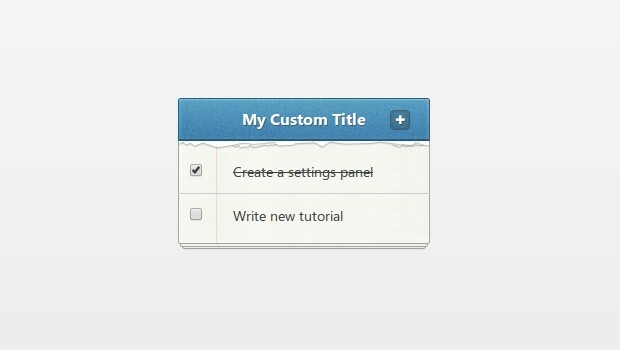 In this tutorial, we are going to explore the functionality for creating settings panels. We will be building upoin the Todo App WordPress plugin we made a few weeks back, so it will probably be a good idea to read that first. We will be using the Settings API, which lets us to only define what settings our plugin needs, and let WordPress handle the actual saving and validating itself. Once you learn how this API works, you will be able to add options panels to your themes as well. We will present two settings to users - the first will give them control over the URL on which the todo application is shown, and the second will let them change the title displayed on the app. We will be changing includes/tzTodo.php and app/index.php to accommodate this new functionality. Both of these options will be saved as elements of an array - this will save us a bit of writing later on, as we will only need to make one function call to retrieve both settings. The first step is to define two new member variables to the tzTodo class we wrote last time. They will be default values for the settings, and the name of the option array that will be written to the database. Why they are declared as protected you ask? Because this way they are not accessible from outside the class, but you can still change them if you decide to extend it. Using the register_setting [docs] function, we are telling WordPress to process and save the tz-todo variable if it is submitted as part of a form. The 'todo_list_options' string is the name of the group this setting belongs to. This is important, as we will need to pass this name to additional functions of the settings api. Next, we have to create the settings page itself. I chose to place it as a sub item in the Settings menu. This is the recommended approach when building settings panels with only one screen. If your plugin has lots of settings, you may wish to split them into several screens and group them into a new top level admin menu. 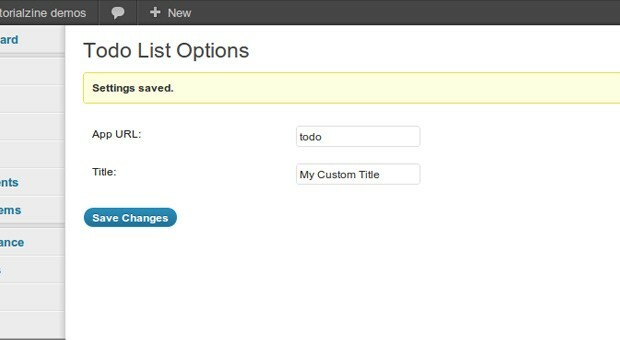 You can see that we are again using the name of the group - todo_list_options, in the settings_fields call [docs]. This function will output hidden input fields that help WordPress validate the submitted form. The last thing that is left to do is to fix an issue that might arise when the plugin is first activated - the options will not exist in the database initially, which would cause the code to misbehave. The solution is simple - we will attach an activation hook and create the options with default values. This will cause the activate method of our class to be triggered when the plugin is activated. I am using the TZ_TODO_FILE constant, which holds the plugin file path and is defined in tz-todoapp.php. The Settings API is only one of the tools that WordPress gives to developers, so they can create better themes and plugins. It is a great addition to one's developer toolbox and will save you a lots of time in the long run. Really great. I like the way you actually explain why you do something. I've seen many plugins that have the settings link near where you activate the plugin instead of in the menu. I've also seen code examples of how to do this, but no explanation of how it works. Any chance you are writing a tutorials on that method of creating a settings page link? Hey man- I am writing a plugin for my first time, and this really helped a lot. I still want a better grasp on this stuff though. Can you recommend a good resource for learning the wp hooks, and maybe some ideas to practice writing this stuff? A place to learn php but specifically with wordpress in mind with its use? Thanks Markus, we fixed it!